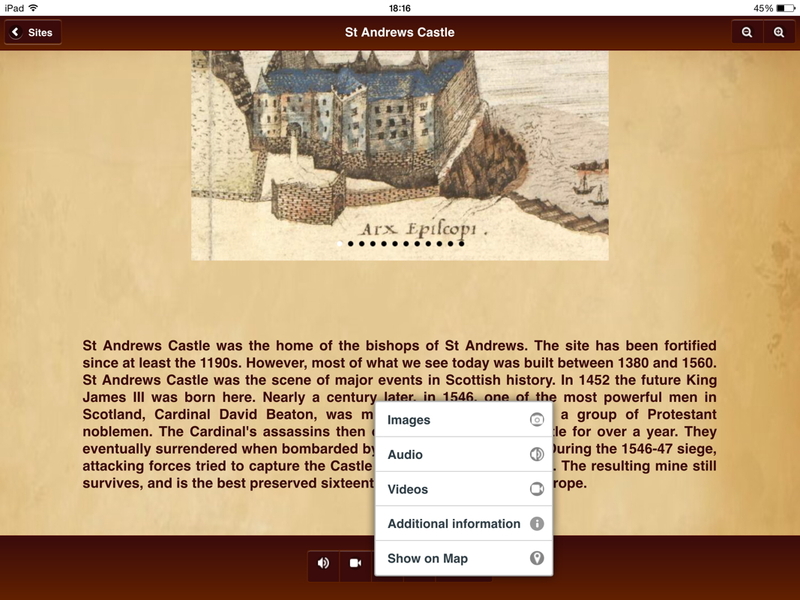 A couple of months ago I reviewed the newly released iOS version of the Mediaeval St Andrews App. Although I praised the content, I ran into an awful lot of problems with the implementation. I encountered lots of bugs, and was particularly concerned about the central design decision that meant the app needed to be always connected to the Internet, so it could download multimedia data, restricting the app’s use out and about – for example on foot in St Andrews – on a WiFi only device like an iPod touch (which I have) and a WiFi only iPad (like my Dad has). A new version of the app was released a few days ago. I am pleased to say that almost all the issues I raised have been now fixed, including the always online issue. The iOS app design has been completely changed from an 8MB core download with constant Internet downloads of resources to a 312MB one-off installation, which installs all the multimedia resources (pictures, video, sound files) at first installation, which means that the app can now work offline and online. This increases the initial installation time and space required, but makes the app more flexible in when and how it can be used. It also has the benefit of making the app now seem much more snappy and responsive in general use. With the original version there was a noticeable lag opening up sites and multimedia resources, caused by the app constantly needing to download more data. But now that this data is all localised on the device at installation it not only means the app can work offline, but also makes it faster and more pleasant to use. 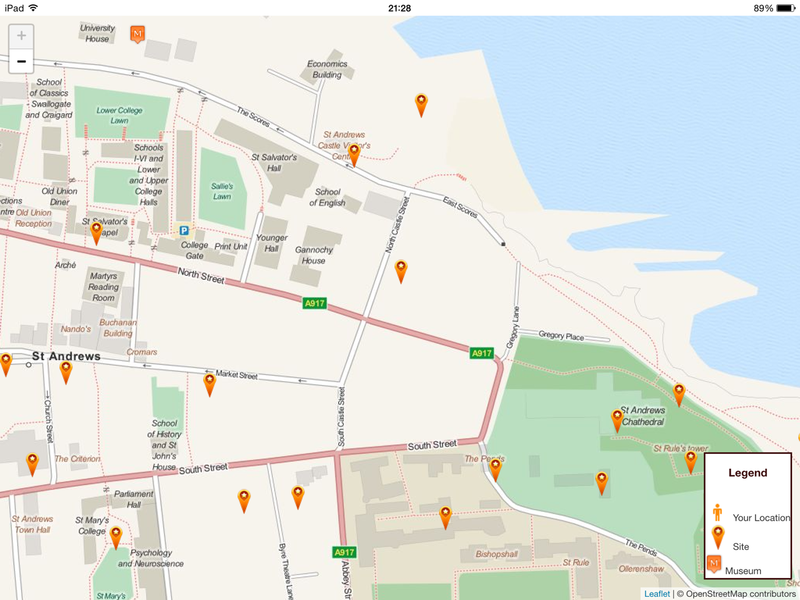 Other issues solved include location services – the app can work without those turned on, but now produces an elegant error message, and can then be used with map or tour, rather than be unusable. Likewise the erratic video playing bugs, and the strange white-out bug I reported have all been fixed. Because I ran into so many user interface issues when I first tried the app my last review focused more on these. Now I can focus more on discussing the content, which I have always thought is superb. The app revolves around three main interfaces: map, site list, and tour. The last of these just has a children’s tour at the moment (which, yes, works offline too now), but more tours are expected to be added in future. The map includes marked sites of interest. Though I notice it has missed at least one major St Andrews museum: the St Andrews Preservation Trust Museum at the east end of North Street. Importantly the map now works nicely with location services turned off, and in offline mode. You can zoom in to select sites of interest, based on their location, and then tap to learn more about them. But the core part of the app, for me anyway, is the sites section, providing access to the history of 22 locations in the town. 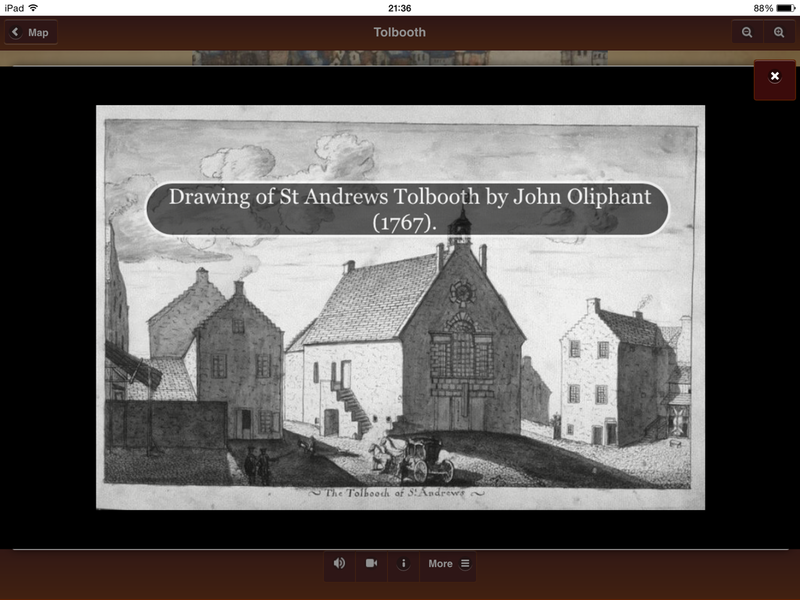 As an example of the depth of information recorded, consider the tolbooth, the former town hall. The main entry for this in the app includes a snippet from the Geddy map as illustration, and then gives a potted history of the tolbooth. This is then supplemented by a range of pictures, audio, video, and additional information. I still find the pictures main user interface unintuitive, not designed like the rest of the app. I’ve been told this is for implementation reasons, because of the plug-in software used to give this functionality. But I still think it’s a shame. A more familiar interface is available from the main site entry page, if you tap on the Geddy map, and then that pops up bigger, and you can swipe left and right through the site’s images, as below. 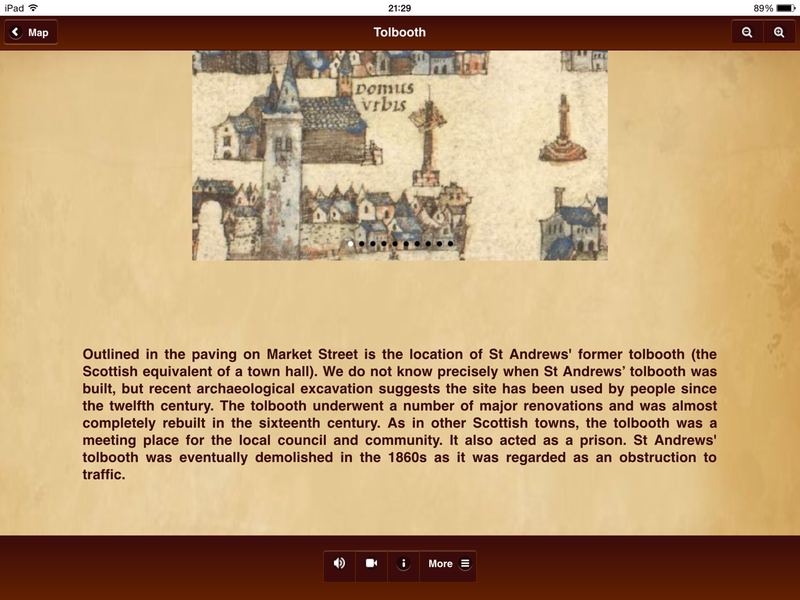 I particularly like the additional information available for a lot of the sites, giving historical snippets and curios, as this screen-shot from the tolbooth entry shows. There is an enormous amount of depth of information in the sites section of the app, that is probably best absorbed slowly over time. It would be useful reference material on foot, for example when in the town exploring the sites, but it is also good for home learning and research. Having said that, if you go to the sites listing, select a site and read about it, it is rather unintuitive to be taken back afterwards to the map interface rather than the sites listing you just used – maybe something the designers might like to look at. Likewise the level of detail varies by site. But usually there is ample to be going on with, and is a good reflection of current knowledge about the town. 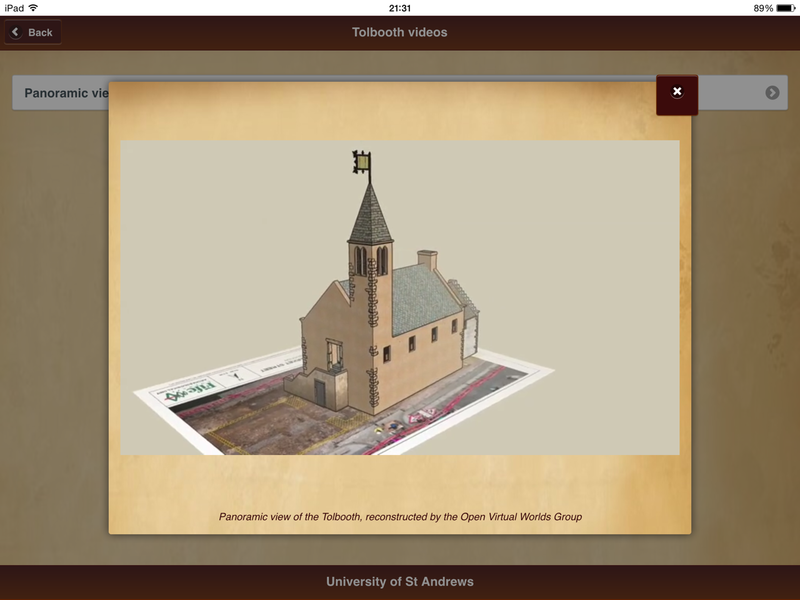 As someone who has researched a tolbooth elsewhere in Scotland (Melrose) I wish we had as much information about it and a virtual reconstruction like St Andrews! I am really pleased with this new version of the iOS app. Most of the implementation issues that I discussed before have been ironed out, and it is now generally a pleasure to use. And the change in design, though needing a big install at the start, means it can be used on more devices and in more ways, and is also quicker and more responsive in general use, without the same lag seen originally. There are still some issues where the app is somewhat unintuitive in use. So I would rate it 7/10 at the moment for user interface and implementation. But that is an enormous improvement on things as they were. And together with my 9/10 rating for content means I give it overall a very strong rating of 8/10. First a disclaimer. I’ve something of a vested interest in this app, as a graduate of computer science at St Andrews, before I switched to history and picked up three more degrees. I really like the idea of St Andrews computer scientists and historians working together to provide this resource. And I like that it’s free. My husband – also a computer science graduate from St Andrews – and I attended the app launch in November 2014, where we got to try out the app on Android tablets provided on the day. We’ve been keen to try it out properly ever since, so as soon as it was available for iOS I downloaded it to my iPad to try. Unfortunately I have run into a lot of usability issues, which I’m going to detail below. But I want to stress that I think the content of the app is superb, the underlying historical resources which it aims to provide access to. For 22 sites in the town each one has a summary description, with a relevant portion of the Geddy map of the town from circa 1580, and typically additional resources like photos (modern, historical and virtual reconstruction), videos and audio files. 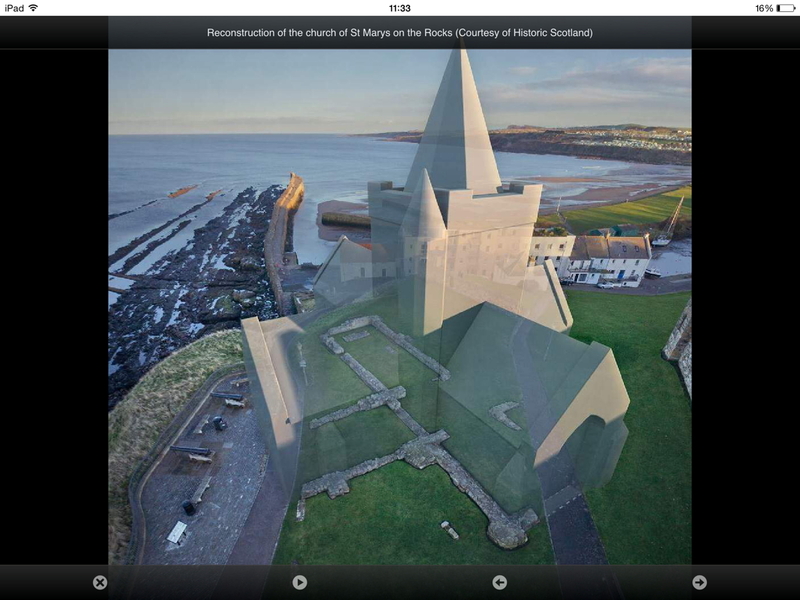 I particularly like where modern and virtual overlap in the app, as in the screen shot below, from the entry for the church formerly above St Andrews harbour. But the implementation of the app and its user interface proved to be a stumbling block for me, and it’s only fair that I detail the issues, not least to help the app creators improve things. I was testing it on my iPad. However my husband and I also noticed many problems in our brief try out on an Android tablet at the app launch. Particularly how slow the app is to use, probably due to it constantly needing to download information to show the user, an inconsistent user interface design, and troublesome bugs cropping up. However what I’m writing below focuses on my experience with my iPad, an iPad Air 128GB 3G + WiFi model running iOS 8.1.2. 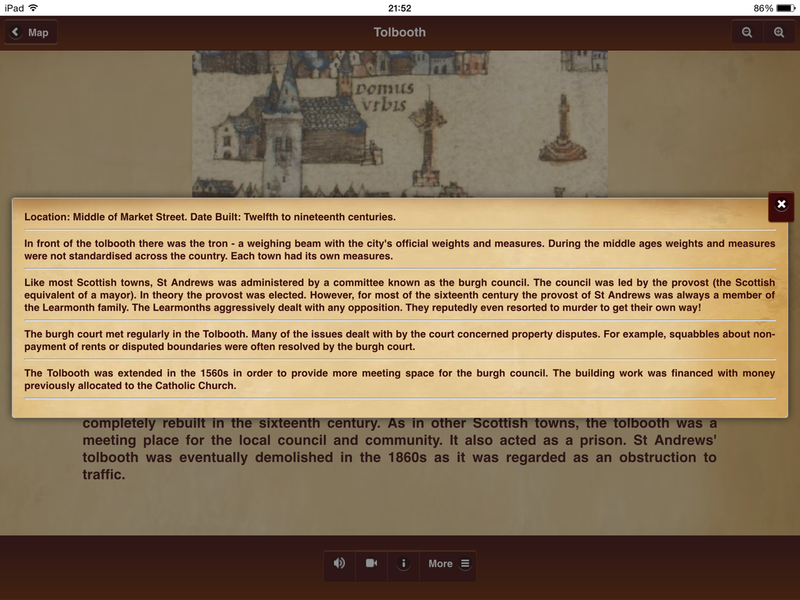 I was using the Mediaeval St Andrews App version 1 for iOS. The first major issue, and it’s a design issue, is that the app requires a permanent online connection. If it’s started with no network connection the screen goes blank and gets stuck in that state. Started with a network though, and all is well. As a long-time user of iOS apps I’m used to offline working, and apps installing everything they need. In practice it’s likely that the amount of data in this case is very substantial, so having an 8MB core app, as it is for iOS, and downloading everything else is appealing. But it won’t always work well. For example I could take the app on my iPod touch to St Andrews, but couldn’t use it as a reference tool without Internet – the iPod touch relies on WiFi, and is not a smartphone. Likewise my Dad has a WiFi only iPad mini, which he wants to use the app on. He can from home, but not elsewhere, including on visits to St Andrews. The constant need for downloading data also makes the app, as we noticed on Android on launch day, often seem sluggish to use, as the user waits for more data to download. And even with a smartphone I wonder how good constant downloading is in terms of data use, especially for larger resources like videos. On the subject of videos, many of the sites in the app have these linked to them. But the videos would not play reliably for me on my iPad. At the first attempt, and even after rebooting my iPad, they would not play at all. They’d start to download, with a download spinning animation, but the videos wouldn’t play at all. Well apart from any linked sound, as in the Katie Stevenson narrated St Andrews Castle video. The sound started as soon as the spinning animation started, indicating downloading. But no pictures would appear. Fortunately a later attempt did get the videos to work, in a window in the centre of the screen, but I don’t know what was different this time, certainly nothing I was aware of having changed. An irritating issue when viewing linked photos for sites is that the user interface changes when you view a photo. Normally there’s a back button you tap to go back to the previous screen. To get the same effect when viewing an image, and to close it to return to the previous screen, there’s no back button, but instead you have to look for and tap a small x cross at the bottom left of the screen to close things. I found this very unintuitive and have not got the hang of it. I ran into other issues. For example the in-app map won’t appear at all if location services are turned off. I don’t normally give iPad apps location services access, and since I don’t have a smartphone I’m unlikely to be carrying this app around as I walk. But turning location services on, even for me located at a distance in Dundee, and suddenly the map worked. I also repeatedly ran into a nasty bug – which I cannot replicate reliably unfortunately to help get it fixed – where I’d be looking at a site’s core listing, complete with Geddy map portion, and suddenly the right half of the screen would go white, and then as I tried to navigate to other sections text would overlay my screen in a very unreadable manner. I also sometimes found the categorisation of linked photos confusing, particularly photos incorporating both virtual reconstructions and modern views, which weren’t categorised as virtual images. But that may be a personal thing for me. This all sounds very negative, but I can’t stress enough that the underlying content is superb. I’d like to see these user interface issues ironed out, at least the easier ones. Change the photo back interface to use the standard everywhere else back button rather than that confusing cross, fix the app so it at least acts elegantly if started without network connection, and check the videos to see if there might be a bug in there re playing them. It’s probably also a good idea to get the map working with location services turned off. Likewise I’d recommend considering the feasibility of providing an offline version of the app, but don’t know how much data that would take up. Perhaps it might be possible to store the core content for example, such as the core site entry pages, which might speed things up in many places, not least loading up each site initially. But if the app must be used in always online mode, then that should be made clear in the App Store description for people to read before downloading and trying to use it. At the moment I can’t rate the app higher than 4/10 for implementation and 9/10 for content, giving 6.5/10 if averaged. But I feel that it has much potential, if only some implementation issues could be ironed out in the next version. A couple of days ago I submitted a revised version of a journal paper that had a revise and resubmit option on it. The revisions were quite considerable, but also surgical in a way. The hardest thing was to get my brain into gear to make them properly, and to make big enough changes. Fingers crossed. Anyway carrying on the momentum in what remains of Academic Writing Month I am now starting a new journal paper. And it is so much fun, and reminds me just how much I enjoy this stage of the process. This paper derives from some research I did for part of my PhD, but it only ended up being a couple of sentences in my thesis. But there was far more behind the scenes, which deserves further analysis, so I’m now tackling that. And it’s another thing I can easily work on at home, which is good. I outlined the article idea in a recent email to a colleague, so used that as my starting point last night. And then, as I always do now, I created a new mind map in iThoughtsHD on my iPad for the article in progress. In particular I’ve developed the opening intro / contextualisation section, although I can see that I need to tie into more historiography there, but that’s easily tackled long term. And then looking over my past archival/research notes I have plenty of material for the middle main section, and should be able to do a nice job. This article is going to take some time to work through and develop properly, and certainly won’t be finished this month. But it’s nice to move straight on from finishing one journal paper to starting a new one. And rather exciting. 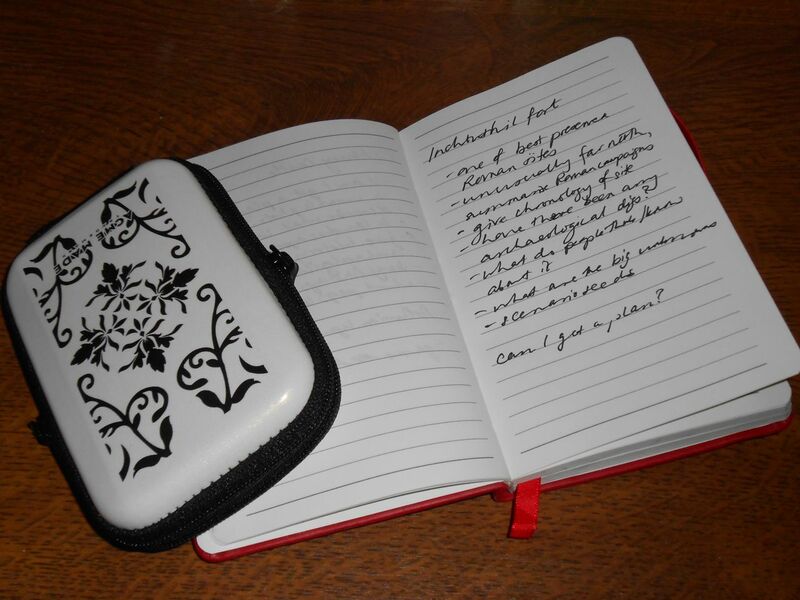 Now it’s the eve of Academic Writing Month 2013, which runs through November, I’m going to state my goals up-front. This is with the hope that doing so will encourage me to complete them. Goal 1 is to finish revising an academic journal paper I have a revise and resubmit offer on, and email the revised version to the editors by the end of November. The editors haven’t asked me to do any new research, or read further around the subject. Rather they want me to introduce my work more clearly, state the thesis up front, etc. That should be doable, if my brain gets into gear, in a relatively short time. For some of the material I add I will probably have to hack out some other content to keep within the 10,000 words (including footnotes) word limit. But, again, that should be manageable. 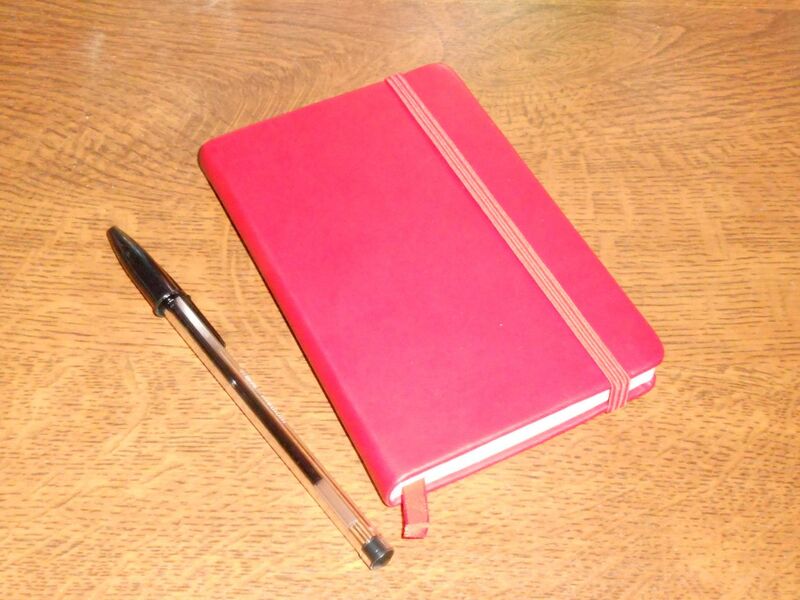 Goal 2 is to research, plan, write and submit a conference paper proposal for the 2014 SHARP conference in Antwerp. I am considering putting in a proposal for a paper based on Doctor Who fanzines. I’m still slightly undecided about doing this, given my neurological disease which is very disabling. I will make a final decision on what to do later in November. But I am gathering relevant academic books on the subject around me, and also brainstorming ideas for my own paper in my favourite mind mapping app on my iPad. The process will take a little time, but I think should be doable before the CFP deadline. Those are my two goals. Alongside them I will be doing other writing, with an emphasis on having fun. And I will continue to judge the 2013 IF Comp entries. But these things will be done as and when I can, rather than towards fixed goals. I was having lunch yesterday with a friend, and something we were chatting about got me thinking about the pros and cons of different social networks for academics. I’m an independent academic historian, unable to work in academia due to a progressive neurological disease, though I have an honorary research fellowship. So I’m essentially non-affiliated, and don’t have, for example, a departmental contact address. Because of this I’ve made a conscious effort to set up an online presence for myself. I have a web page. You can tell I’m a former computer scientist: like most academic computer scientists it’s remarkably simple HTML coding, and looks quite retro. But it’s functional, and describes my credentials, and interests, and gives links to other things. But I’ve also reached out to various social networks. Linkedin is nice for keeping a contact method with people I’ve known in the past and more recently. And I quite like getting the update emails, on people’s new jobs and so on. But I don’t find it very useful for keeping up to date with people’s research, and, for example, publications. I’ve found that most Linkedin members don’t update their profiles that often. It’s more a handy keep-a-contact method for me. Academia.edu has often been lauded as the most appropriate social network for academics. But I find it the least useful. Again the problem is that most people don’t update their profiles that often. Also it tends to only favour completed research, where it’s been written up, and, for example, published as a paper. Research in progress is less likely to be mentioned. I do like the weekly emails I get telling me about new papers in my areas of interest. But even these are just a drop in the ocean, since most members on the site don’t update their profiles that much. And I don’t find following other academics has been terribly useful. I also don’t like the site’s tendency to over email. I’ve fiddled with my settings, so I no longer get an email every time someone looks at my profile etc. Oh and can I just note how irritating it is that I don’t seem to be able to set up a secondary affiliation for my honorary research fellowship. As soon as I do that it clobbers my primary independent academic status. And vice versa. Aarrgghh! The most useful social network I find for following academics is Twitter. This only works for academics who tweet regularly, but I follow a lot of historians, and archivists, and many of them tweet about their research in progress, interesting conferences, and new publications. On the downside following these tweets takes time, regularly. I follow nearly 1000 people on Twitter (not just academics), and given how knocked out I am I can’t see all their tweets. But I put a bit of time in each day to follow them, using Flipboard on my iPad to browse hours of recent tweets in a nice way. And I find the time put in is well rewarded with the info I get back. I also tweet myself. I describe myself on Twitter as an “Academic historian, genealogist, former computer scientist, and Doctor Who fan”, which pretty much sums up the subject pattern of my tweets. But I find tweeting rewarding, and often make good contacts, and have good discussions on Twitter, with fellow academics and researchers. I’m also on Google+, again as a sort of storefront for my academic identity. My Google+ profile is handy for linking to all my other online presences. But it’s a bit of a ghost site, and although I use it, and post to it, I don’t make many contacts with academics there. The major social network I haven’t mentioned so far is Facebook. I don’t find that useful for being in touch with academics. It’s more for keeping in contact with friends and family. And of course it’s a closed network, not open to general readers unless they are Facebook members. Even then I have my settings set so only my Facebook friends can see my posts. It has a role, but not for academia for me. For independent scholars like me I would strongly recommend cultivating an online presence. But, as I’ve argued, Twitter is likely to be the most useful academic social networking tool you can find, and the one that gives most rewards for the time you put into it. Even following a few key active academics in your field is likely to reap rewards. Another to-do catch up here. I’ve put my chapmen research project on hold for now, because I’ve been too knocked out lately to move it forward. In particular I’ve not been able to move the necessary reading forward, and there’s an awful lot of that I need to work through effectively. There is also the issue of what I can include in any resulting paper, given the costly open access implications. I haven’t quite worked out what to do with that yet. But other things are looming more quickly, and must take priority. I’ve sketched out my talk for the archives conference next month. I only have to speak for 10-15 minutes, in quite a packed panel, so will need to be concise and to the point. But I think I should have just the right amount of material for that. I’ll be practising to check on the timing issues nearer the time. 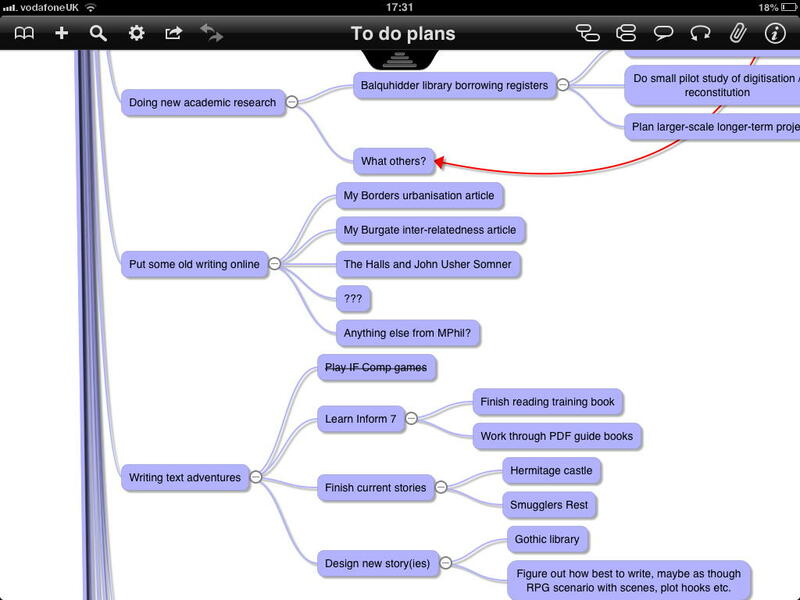 Again I used my iPad to develop my ideas, creating a mind map of what I’ll cover, using the iThoughtsHD app. The other looming thing I need to focus on is working on necessary revisions for a paper that’s been accepted by an academic journal for publication probably next year, subject to the necessary revisions being done. I’ve got the reports from the two readers, and have drawn up a list of the key things to focus on. And again I’m doing the main work on my iPad, having transferred the readers’ reports to there, as well as the latest working version of the journal paper to annotate using my stylus in Goodreader. The revised version of the paper needs to be with the editor in a couple of months, so I’m prioritising working on that now. I’m also resuming work on my interactive fiction game. I’ve sketched the overall plot in a mind map using iThoughtsHD, and am coding up the game in Inform 7. It has a lovely integrated development environment, which in many ways makes programming like playing a game, and is ridiculously good fun. But large games are still complex entities, so I’m growing mine slowly and steadily, in careful steps. 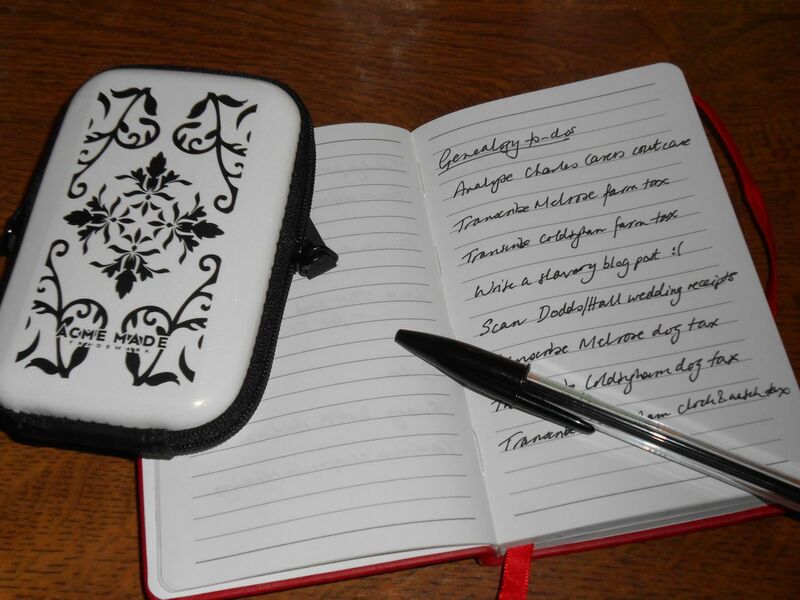 I’ve found that sketching out the overall plot in advance has been really helpful, to keep me focused and productive. The other thing I’m working on is a series of articles about places with strange histories and much potential for roleplaying ideas, especially horror games like Call of Cthulhu. This developed from a series of articles that I’ve been writing for the Yog-Sothothery magazine for patrons of the Yog-Sothoth website. But I’ve so many possible articles that I could write that I may end up working on something standalone, in anthology form. Anyway I’m having a lot of fun writing these places. Two-thirds of the articles completed so far are about Scottish places with strange histories, and the other third about English things. Generally, though, I find it best to write about things I already know quite a bit about, hence the leaning towards Scottish subjects.